The cracking of the Cipher Challenge was a major story in the British Daily Telegraph, and it was also featured in the Swedish and American press. The Telegraph article is featured below. 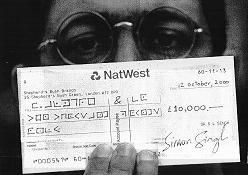 This picture shows me with the winning cheque, which was encrypted. I went to Stockholm and presented it to the winners in person. A TEAM of Swedes using dozens of computers has beaten thousands of rivals across the world to crack the toughest public code challenge in history and claim a £10,000 prize. 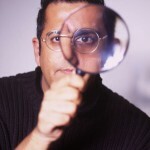 The challenge, which consisted of deciphering 10 messages encrypted using techniques of increasing sophistication, was made a year ago in Dr Simon Singh’s The Code Book, which turned into an international bestseller. Dr Singh said: “It seemed natural to me that a book about the history of codes and codebreaking should contain some coded messages to stretch the mind of the reader. His web site will announce the news today. He now plans to present the Swedish team, led by Fredrik Almgren, with a cheque for £10,000 encrypted in a code known as the “Pig Pen” cipher. The fact that the most difficult code in the challenge was cracked – albeit by a well-equipped team of programmers – raises questions about internet banking and shopping since this kind of cipher is used for online security. Dr Singh, who has a doctorate in physics from Cambridge University, took two years to devise the brain teasers with the help of Dr Paul Leyland, who works for Microsoft in Cambridge. They worked in secrecy, taking care that no material relating to it fell into the wrong hands. Dr Singh said: “I regularly went into my little garden, dipped the relevant papers in molten wax and set them alight.” The tenth stage was encrypted using computer ciphers and is what the experts call a 512 bit code. It was “the toughest public code challenge that has ever been cracked”, said Dr Singh. Thousands of amateur and professional codebreakers attacked the problem. One of the web sites where budding codebreakers gather to share ideas attracted more than 2,500 people, from absolute beginners to maths professors. Only a few days ago, the prize seemed safe when Dr Singh paid out £1,000 to the team that did the best after a year: John Palagyi and Jim Gillogly, who had cracked nine out of the 10 stages. The latter is former president of the American Cryptogram Association, who recently made headlines when he cracked the ciphers on Kryptos, a sculpture in America’s Central Intelligence Agency, in Langley, Virginia. But in the past few days an innovative method to crack the hardest cipher paid off for Fredrik Almgren, Gunnar Andersson, Torbjörn Granlund, Lars Ivansson and Staffan Ulfberg in Sweden. They plan to celebrate their achievement in Stockholm tonight. Ulfberg, Ivansson and Andersson had entered the challenge while working at the Royal Institute of Technology, Stockholm. The Swedes first became interested in the challenge after Almgren picked up a copy of Singh’s book while attending the London Juggling Festival (three of the Swedes are jugglers.) The final stage was the toughest but stage five was “the most annoying,” said Mr Almgren. The cipher consists of numbers which refer to letters in a book. They scoured the Bible, the Adventures of Sherlock Holmes (mentioned in The Code Book) and a vast range of other texts to no avail. Some of the messages in the challenge were encrypted using ciphers dating back to ancient Greece and Rome, while others were encrypted with Victorian cipher or systems dating from the First and Second World Wars, including the Nazi Enigma cipher. The Code Book has formed the basis of a television series that charts the history of codes and codebreaking, The Science of Secrecy, which is being aired on Channel 4 tonight. A few days ago, Singh set a challenge to Daily Telegraph readers to crack a code used in the Kama Sutra. A record 4,500 entries were received within five days.